But wait, there’s something not right about this. First, it was the Western Empire that technically came to an end in 476 with the deposition of Romulus Augustulus by Odoacer (almost a full century after Adrianople). I write technically, because although Odoacer was German by ethnicity he was a Roman general, and had no intention of “ending” the Empire, but was recognized as patricius, the imperial protector in Italy. The emperor was gone, but the fiction of empire continued, and would continue for several generations. This is the western half of the empire. Adrianople happened in the eastern half, and involved the destruction of an Eastern Imperial field army. Yet, the Eastern Empire would not last only a century after Adrianople, but more than a millennium, until the capture of Constantinople in 1453. Clearly, Adrianople did not have a direct or immediate effect on the longevity of the Roman Empire. Why then this apocalyptic view? 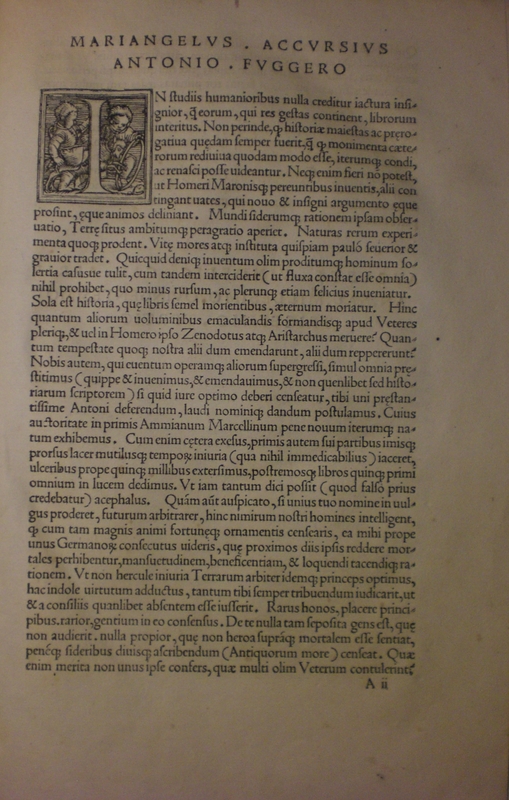 To a large degree, it’s because our primary source for the event is Ammianus Marcellinus. Ammianus was born about 330 in the city of Antioch, likely from a conservative, upper class Greek-speaking family, rather than from the Syriac-speaking lower classes or country-folk. He became a long-serving officer in the Eastern Roman army, and was a devout follower of the traditional Roman pantheon headed by Jupiter (literally Zeus the Father). From all we can tell, he was well-educated and successful, a shining example of a socially-responsible Roman aristocrat – sober, conservative, virtuous and self-sacrificing to state and family (in that order). And he was depressed. His hero the emperor Julian was dead, murdered during a difficult campaign against the Sassanid Persians. Julian had been the last best chance to restore religious dignity and to maintain the rites so necessary to win the favour of the gods. Christianity itself Ammianus called, in a not necessarily complementary manner, “a plain and simple” religion, but its emphasis on mercy and forgiveness were hardly qualities needed by a robust Roman state. More serious, however, was the outright attack on traditional beliefs. Not only were the old rites and cults neglected, temples and altars were being destroyed. Right around the time Ammianus was completing his work, between 391-392, the Christian Emperor Theodosius had launched a campaign of persecution against the gods, with the spectacular destruction of the temple of Serapis in Alexandria. Bad enough if the emperor turned his back on the gods, and ignored the high arts of divination and the interpretation of omens; but directly attacking their holy sites could only result in the gods’ wrath. For Ammianus, the Roman world was in decline, but it was not so much a military decline – military disasters such as Adrianople were merely symptoms of the real problem, and that was the decline in virtue, morality and religious values. This dark and ominous mood is the backdrop of Ammianus’ work, and through him became the main theme of Edward Gibbon’s monumental history, The Decline and Fall of the Roman Empire. Gibbon, writing in the 18th century, certainly no friend of the Christian church, saw the defeat of Rome as the success of “Barbarism and Religion.” If, however, you saw the decline of pagan cults as no bad thing, the future may not have appeared so dim. The whole debate of the decline and fall, when it began, and if it really occurred at all, is too big a topic for this piece. However, one can certainly question whether Adrianople was part of a long decline or simply part of one of the several up and down power cycles that the Empire experienced. A key issue is numbers: just how big were the armies involved, and thus, how serious were the imperial losses? There aren’t any published orders of battle from the time, so there has been much conjecture. We can certainly disregard the old idea of a horde of Goths numbering into the hundreds of thousands. The term Goth refers more to a language and not a political entity. The later confederations of the Visigoths and Ostrogoths, which came to dominate large sections of the western Roman Empire were not simple re-namings of the earlier Therungi and Greuthungi. These early groups were very loose federations where the most important political entity was the clan (or pagus in Latin) under a council led by a reiks (rix, rex, raj, king). The clan councils would elect a “high king” or thiudans, often more than one, to represent the whole, especially in times of war or other crisis. These kings had no powers of coercion. Athanarich, leader of the Therungi after 367, corrected the Romans when they called him basileus, the Greek word for king or emperor, preferring the term iudex or judge, the closest meaning to thiudans. And by 360, crisis had arrived in the form of a new mounted threat from the Asian plains, the Huns. A Turkic speaking people, the Huns were possibly the Hsiung-Nu of Chinese annals. The Alans, another Turkic nation, were located to the east of the Greuthungi and were the Huns’ first victims. But the Huns were not simple destroyers. Allying with the Alans, a new and even more powerful force hit the Greuthungi, under their thiudans Hermanrich. Defeated in battle, Hermanrich committed suicide. Some clans then allied with their conquerors, while others under Alatheus and Saphrax (probably an Alan) fled west, bringing tales of terror with them. 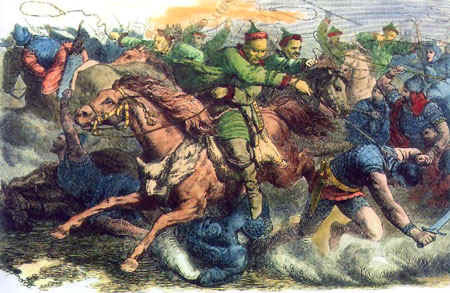 Athanarich also attempted to stop the Hun-Allied army in the field and was crushed. He then attempted to build a wall to negate the Hunnic cavalry, but was defeated a second time, this time decisively, before the fortifications could be completed. Some clans apparently had not supported Athanarich from the start, and after this catastrophic defeat, more clans deserted. In 376, Athanarich and his followers, fled into the Carpathian mountains, and were in strong enough numbers to defeat and eject its Sarmatian inhabitants. The remaining Therungi also fled west, under two new elected thiudans, Fritigern and Alavivus. Their goal was to seek the protection of Roman Empire. After negotiations, the Therungi were allowed to cross the Danube after giving up their weapons. They were to be settled along the frontier as foederati or allies, a long-standing Roman policy of frontier defence. How numerous were these refugees? J.B. Bury (in The Invasion of Europe by the Barbarians) has estimated the total population of a large East German federation at a maximum of between 80,000 to 120,000, based on the fact they were dependent on subsistence farming. When the Vandals crossed to Africa they were tallied at 80,000, so the necessary shipping could be acquired, and this number may be relatively accurate. Gibbon’s estimate of one million is clearly a gross exaggeration. Between losses and defections to the Huns, further losses during their flight and crossing of the Danube, the remnants of the Therungi that followed Fritigern and Alavivus would probably have numbered no more than 40,000 at maximum. And they were weary, malnourished and now largely unarmed. No wonder the Roman officials in charge of the resettlement, Lupicinus and Maximus, thought they could extort whatever wealth these poor refugees had managed to save. Instead of distributing food as promised, provisions were sold at inflated prices. The Therungi were kept as virtual prisoners in their camp as the promised lands for resettlement were withheld. Some of the Germans were even sold into slavery to buy food. The starving Therungi grew restless, and in fear, the Lupicinus attempted to assassinate the German leadership at a banquet. Alavivus and many reiks were killed, but Fritigern escaped. An open revolt now broke out, with the Goths using wooden clubs to supplement the few weapons secretly stashed away. In the confusion, Alatheus and Saphrax, with their Greuthungi bands crossed the Danube. Fritigern’s bands spread across the countryside pillaging for food. The small Roman garrisons were overwhelmed where they were found, and now Roman arms were also added to the Goths’ growing arsenal. Fritigern also picked up support from the local peasantry, many of whom were not at all displeased to see their landlords chased off. Order Fading Legions today and play out the battle on your gaming table.